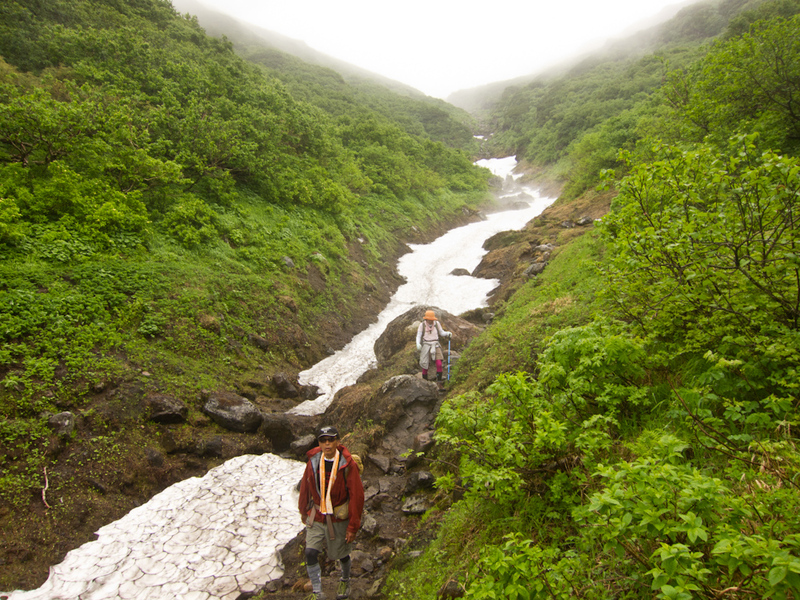 The hike begins at the trailhead of Rausudake at Iwaobetsu Onsen. There’s a hotel where you can park your car, or you can catch a bus to Iwaobetsu Youth Hostel where it’s a 30~45 minute walk to the trailhead. There’s also a hut called Kinoshita Koya where you can stay the night. 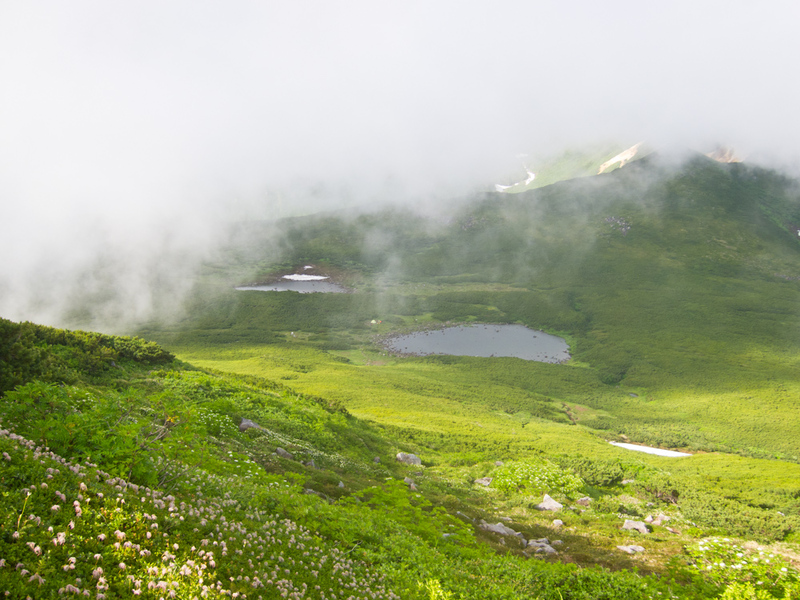 A lot of information on this if you just search for hiking information on Rausudake. 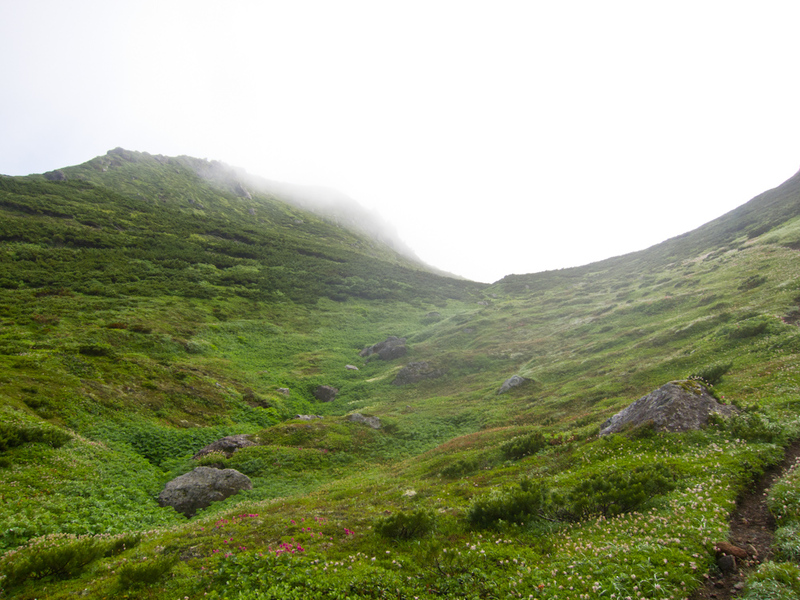 After walking through the forest for a bit, you climb up a long gully which was still snow-filed in early August. 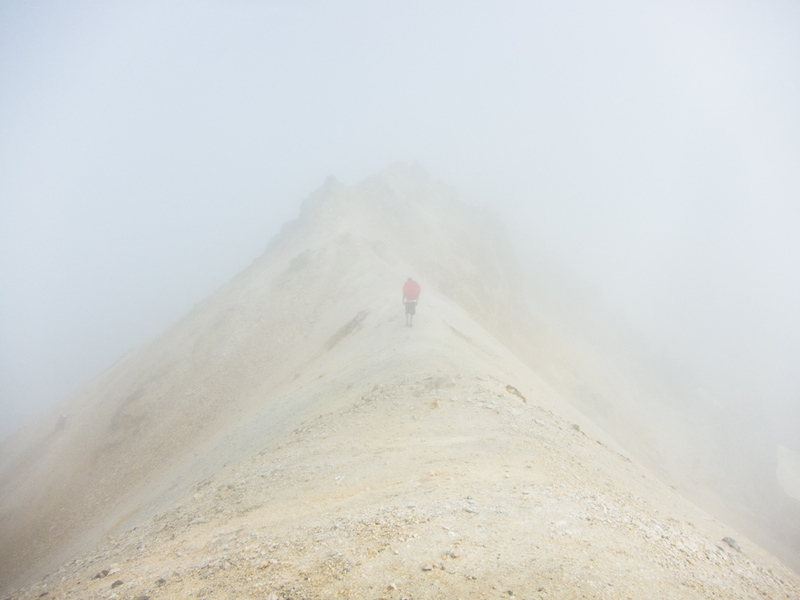 Poles are definitely helpful as the climb up is long, steep, and relentless. 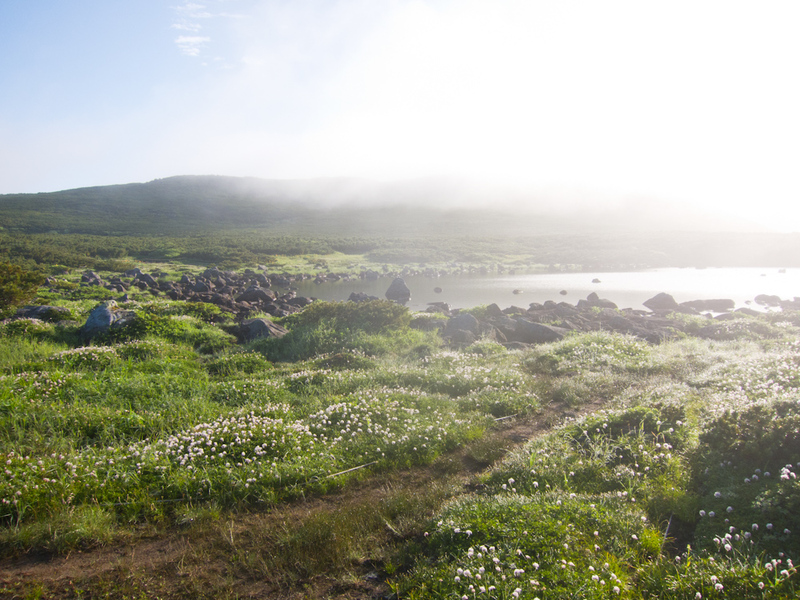 Eventually you’ll reach Rausudaira, which has a campground and is also a 4-way junction between where you came from, Rausu-cho on the other side of the Shireotoko peninsula, Rausudake, and the trail going towards Iozan. 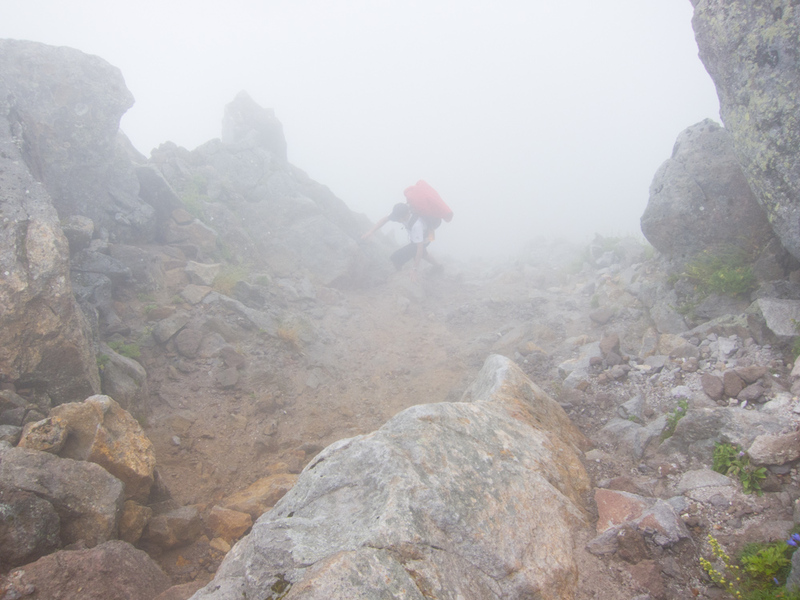 The climb up to Rausudake is a relatively quick scramble up some big boulders. 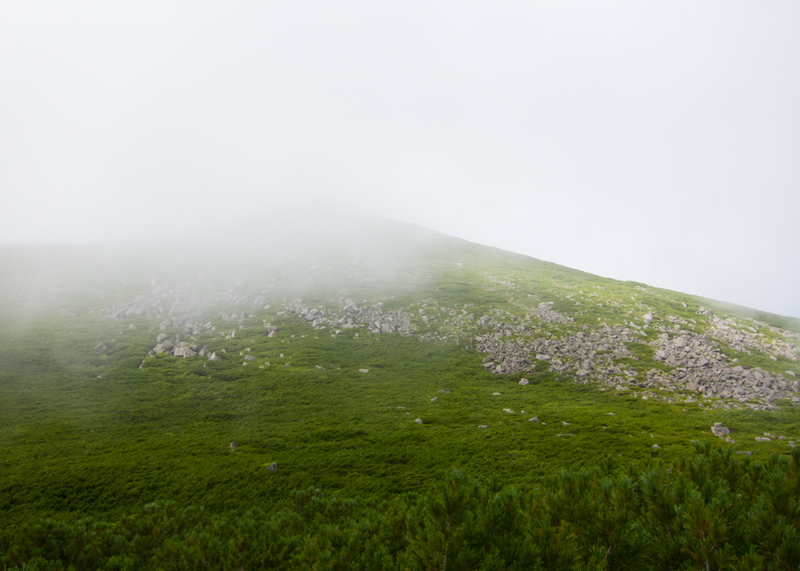 Unfortunately the clouds were in and I couldn’t see anything when I was up there. Also there were bugs everywhere. 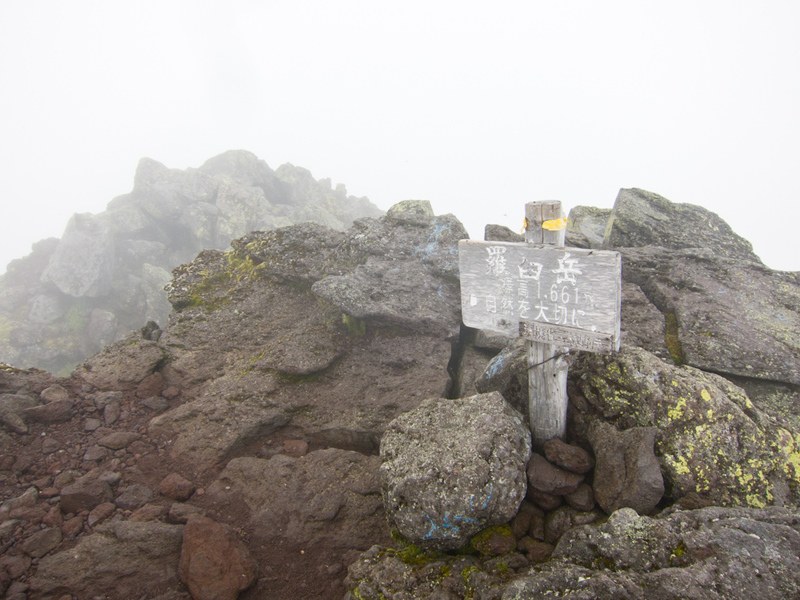 To continue the traverse, come back down to Rausudaira and continue on to the other side. The trail becomes very narrow and filled with dwarf pines from this point, so rain pants or gaiters may be a good idea if the clouds are in and the pines are wet. My entire lower body including my waterproof boots were completely soaked by the end of the day. Oh and don’t forget a cover for your backpack either. 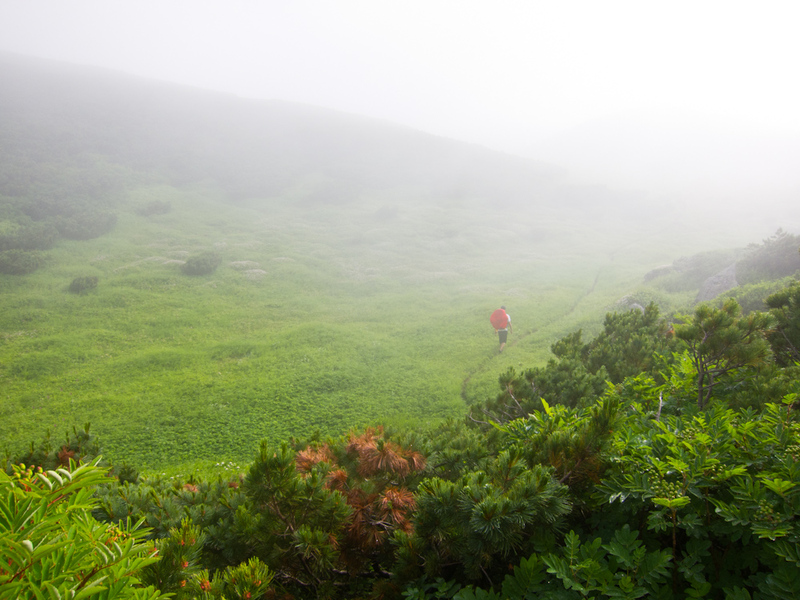 You go up and down over a few minor peaks and also past a campground at Mitsuike. 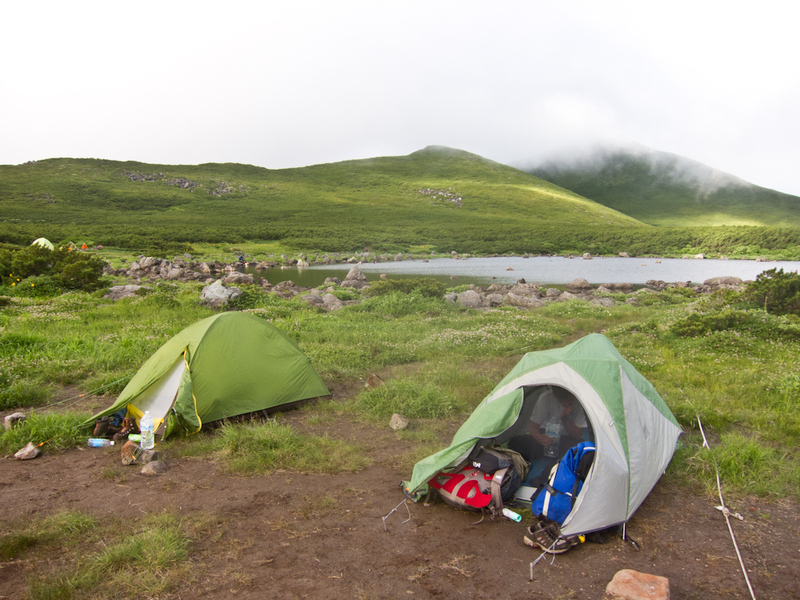 I camped out at the next campground at Futatsuike which makes the second day a bit easier and also is a nicer camground by a couple ponds. The water definitely needs to be treated, so probably best to just bring lots in the first place. 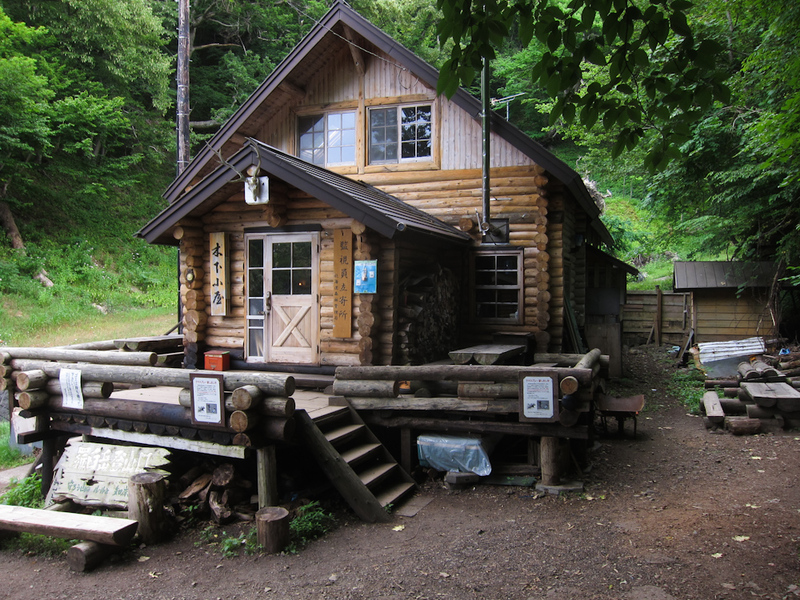 Also, the place is infested with mosquitoes that easily bite through base layers. There are food lockers at every campground by the way so no worries about carrying a bear canister. The hike continues from the campground through alpine meadows and then steeply climbs where the scenery will quickly change from the green of the pines to the yellowish white of volcanic soil. 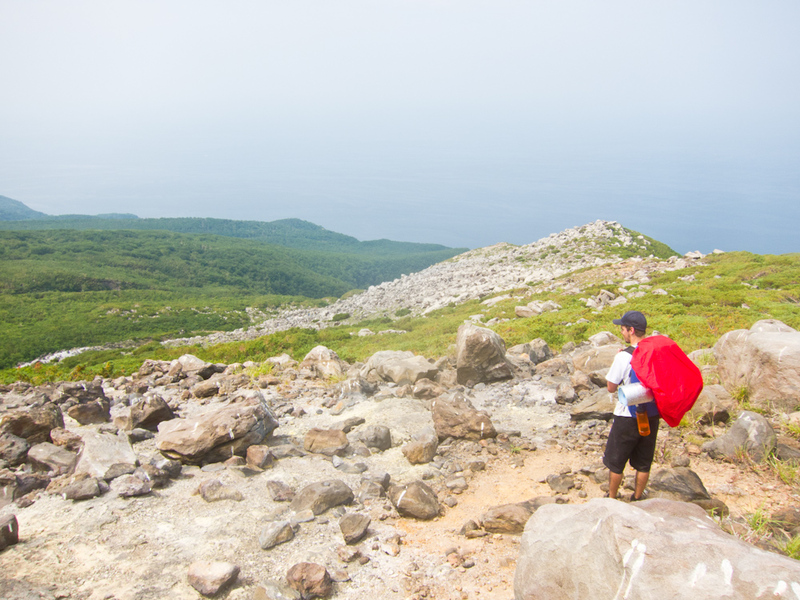 At this point there is also a junction where the trail either goes left towards Iozan or right into even deeper parts of Shiretoko Peninsula, Shirtokodake and beyond. 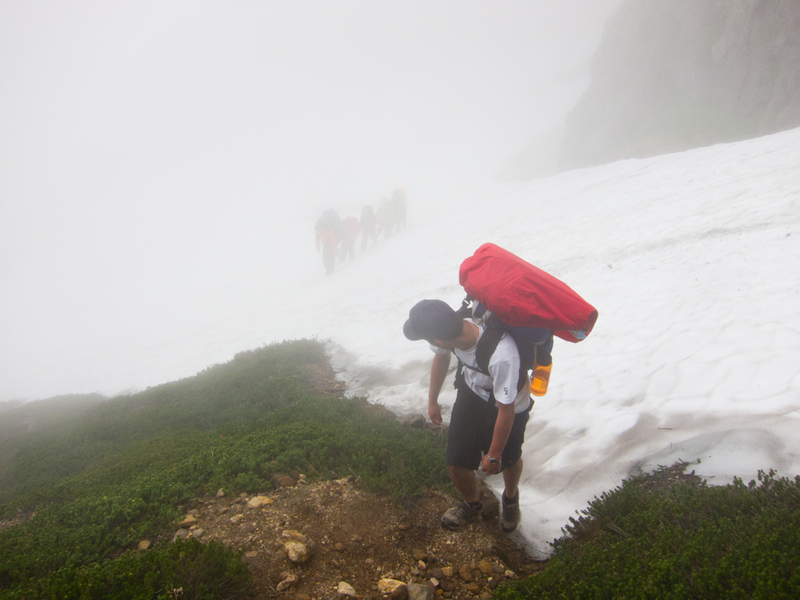 The descent is just as long and grueling as the initial climb, down aother long snow-filled gully. Eventually you’ll come out to the road which is closed to the public. Backtrack south down the road and eventually you’ll get to a bridge where the Kamuiwakka Falls bus stop is. I was too tired to even check out Kamuiwakka falls. Catch the bus back to Iwaobetsu Onsen and then walk some more to get to your car in the parking lot of the hotel, or continue on the bus back to Utoro. 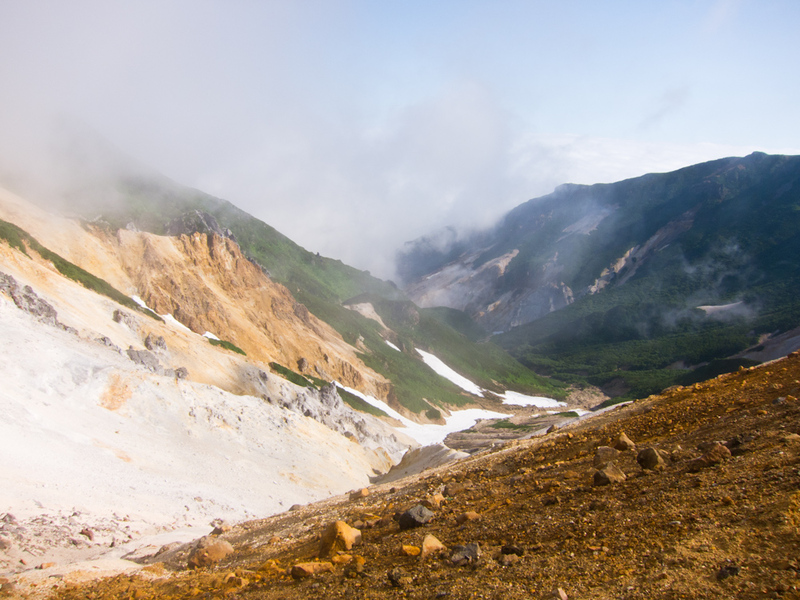 Being under/ill-prepared, the hike was pretty miserable at the time, but looking back through the photos, Shiretoko is definitely an amazing place and this hike takes you right through the thick of it. There are beautiful alpine flowers throughout the route (in August) and the view are (probably) incredible in clear weather. I didn’t see a single bear through the two days though. I should go back. Hello I am interested in doing this in winter -March but with a guide, I don’t suppose you have any tips on how to find a guide do you? Unfortunately I do not.. Are you looking to do the entire traverse? From what I understand road to Iwaobetsu Onsen (where the hike starts) and Shirteoko pass is closed so it would make for quite a trip. Doing some research online might find you something but might be quite unlikely. Sorry couldn’t be of more help, but lemme know if you end up finding something!